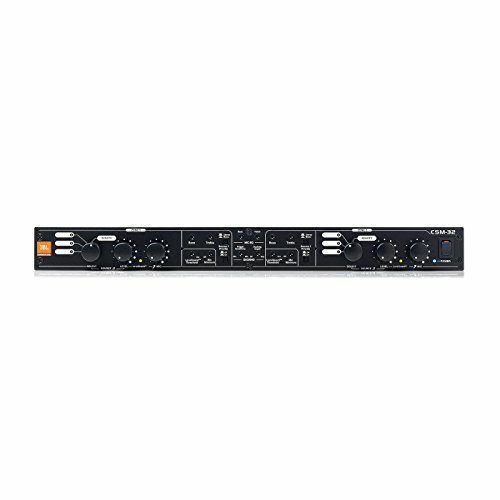 The CSM-32 features three stereo music inputs with gain control and clip LEDs, and two stereo outputs with active crossovers and dedicated subwoofer outputs. Two additional inputs are provided for music override. First, a mic input with phantom power and gain control allows page steering to different zones, ducking the music by a user-configurable amount. Second, a line input allows high-priority routing to all zones, which is ideal for alarms. An additional transformer-isolated mono output is provided for connection of a music-only mono output, which is ideal for music-on-hold systems. Dedicated controls for music EQ per zone and dedicated controls for global mic EQ allow the frequency content of each input type to be customized independently. In each output channel, LevelGuard is provided to retain consistent volumes between the various inputs, and AutoWarmth is provided to ensure full fidelity at all zone volume levels. Zone Remote ports 1 and 2 facilitate connection of the CSR wall controllers, which can provide source selection and/or volume control in each output zone. Source select per zone, music level per zone, and mic level per zone can also be controlled on the front panel. For additional control, two logic inputs facilitate page steering and music muting via contact closure. Two RJ-45 Link ports allow multiple CSM devices to be linked to increase the number of output zones. Linking CSM devices shares the inputs from the main devices over Cat5 cable and eliminates the need for Y-cables.